“Man’s best friend,” or so the saying goes. But often, man’s best friend can bite and cause serious injury. More than 4.7 million people sustain dog bite injuries every year in the U.S. If you were bitten by a dog, contact a dog bite attorney. We can help obtain the compensation you deserve. Who Is Responsible If I’m Bit by a Dog? California law holds dog owners strictly liable for the injuries and other damages their dogs cause. This means that dog owners are responsible for dog bite injuries their dogs cause irrespective of whether they knew their dog was dangerous. Usually, the dog owner’s homeowner or renter’s injuries will cover the costs of both the physical injuries and property damages the dog caused. You do not need to prove that the dog was negligent or reckless. However, other states adhere to the “one-bite” rule. 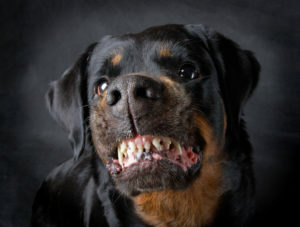 This means that the owner is liable if they knew the dog was dangerous or, having bite someone before, is likely to bite. A dog bite attorney takes note that no matter how careful a dog owner is to ensure the dog won’t hurt others, the dog owner is still liable to the victim if the dog bites the victim. What’s My Burden of Proof as the Victim? A dog bite attorney can review your case and gather the necessary evidence to help you meet your burden of proof. If My Dog Bite Someone, Am I Responsible? What Happens If My Dog Was Provoked? You are not responsible for injuries if your dog was provoked. There are many ways your dog could be provoked, such as: teasing, taunting, pulling, holding, grabbing, and hitting a dog are some examples. Am I Responsible to the Trespasser? You may not be held liable to a trespasser that your dog bit. However, you could be held accountable under the negligence theory if you fail to provide adequate warnings you do not want anyone on your property. Warnings may include fences, signs, or locked gates. A dog bite attorney can prove the injured person had knowledge of the risk if s/he was warned of your dog’s dangerous propensities. The warning could be a verbal warning or a posted signed. Dog professionals—groomers, walkers, sitters, trainers, and veterinarians) are presumed to have assumed the risk as long as you informed them of the dog’s vicious propensity. If you are dog sitting, you also assume the risk and the responsibility of controlling the dog. And if you know of the dog’s vicious propensities, you could also be held liable if the dog bites someone. If you were bit by a dog, or if you own or was watching a dog that bit someone else, seek assistance from a qualified dog bite attorney with Russell & Lazarus APC. Call 949-851-0222 today.